"Light aims to put a bunch of small lenses, each paired with its own image sensor, into smartphones and other gadgets. They’ll fire simultaneously when you take a photo, and software will automatically combine the images. This way, Light believes, it can fit the quality and zoom of a bulky, expensive DSLR camera into much smaller, cheaper packages—even phones. 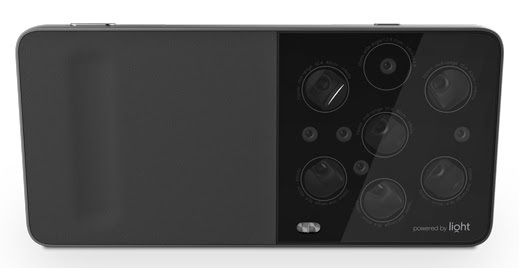 ...the startup says it expects the first Light cameras, with 52-megapixel resolution, to appear in smartphones in 2016. ...an array of 16 camera modules with focal lengths of 35, 70, and 150 millimeters. ...when you take a picture with a Light camera it’s taking several pictures at the same time from slightly different perspectives (though it won’t show them to the user). The level of zoom that the user selects determines which modules will fire when he takes a picture, and where the mirror contained in each module moves to capture light. It could aim for light straight ahead, or off at an angle, for instance. The resulting shots are then digitally combined in a way that emulates a much bigger camera lens. ...Light is still in the early stages, as it doesn’t yet have a prototype of a full product completed. Light plans to announce a deal on Tuesday with Foxconn, the world’s largest contract electronics manufacturer. Foxconn is licensing Light’s technology for use in mobile devices and is investing an undisclosed amount in the company." look like from the back. Instead, they could try to improve and perfect MEMS or liquid lens based focus systems. Ironically, their claim seems to be a perfect stepping stone in the direction of simplying things through better integration; rather than spreading the problem out through brute force. They have no prototype yet but they expect to be in production in 2016? That's a dream at best. I count eleven cameras. Say $5/camera, that's at LEAST $55 in costs and probably far more due to all the custom, low-volume lenses. Is higher resolution so important to justify the additional power, processing time, production costs, and an additional $200 to the device cost? I'm sure Foxconn is interested - look at how many cameras they might sell. Then again, they probably won't. Aside from a few dual-camera companies, all the multi-camera businesses have not had much success. Multi camera is an extremely interesting feature with large positive effects. I cant get it fast enough, but i understand its not developed over night. The time will come and I am certain it will be a success and no turning back. Point is that even their very first public statement is clearly over-promising. There's no way this will be in a product in 2016. I already have problems with my finger being in the picture on my smartphone. This will be much worse. Opposite. No matter where your finger are, there still will be a usable image. Rear camera module in a high end phone (S6, 16Mpix BSI, AF, OIS) costs $18.50 so it is a steep price to pay for this configuration, even before size and power and computation challenges come into play. I'm sure many don't mind the camera in the phone is more then 8% of the total material cost. There is sold about 15 million system cameras a year and in my opinion still no camera phone on the market taking this customer group seriously. The approach with multiple (>2) cameras offer some interesting solutions to mobile imaging. The rendered configuration of these cameras is not optimizedand may be an early prototype. These cameras need a custom bridge chip for the synchronized captures and selectively passing into a thirty party SOC. The port bandwidth is a bottleneck when/if all are selected. The large separation also makes the camera mounting difficult requiring a special backing for thermal and rigidity (anti bend). The large separation of the viewpointsmake the registration of the images very difficult for closeup objects but they produce nice depth data. The separation is less an issue for objects at far distance though. CEO Dave Grannan already said the set of cameras would cost about $50 - $60. So for a premium BOM of $300 with previously $20 budget for camera, this would come to $330 (with camera accounting for 15%) at least as the RAM and bandwidth need to be increased too to accomodate for the images of higher resolution.